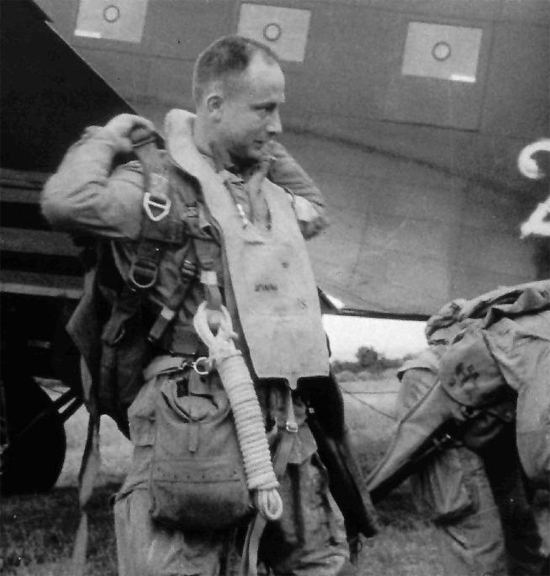 Photo of Major William E. Barfield, Commanding Officer, 326th Airborne Medical Company (101st Airborne Division). Like many other Airborne units of the US Army, the 326th Airborne Medical Company can trace its history back to the First World War. The 326th Medical Company was initially constituted on 23 July 1918 as the 326th Sanitary Train. It formed part of the 101st Division. After being deactivated on 11 December 1918 following a change in structure of the US Army, it was reconstituted 24 June 1924 in Milwaukee, Wisconsin as the 326th Medical Regiment, and once again assigned to the 101st Division. On 30 January 1942, the Regiment was once again redesignated as the 326th Medical Battalion of the 101st Division. The Army, in preparation for the new war in Europe withdrew the Battalion from the organized reserves and assigned it to the Army of the United States on 15 August 1942, once more reorganizing the unit now officially designated as the 326th Airborne Medical Company. Major William E. Barfield was assigned as the Commanding Officer of the Company. The unit began to enlist personnel and was activated officially at Camp Claiborne, Alexandria, Louisiana, 15 August 1942 as an element of the newly organized 101st Airborne Division. In preparation for the invasion of Europe in 1944, the Company was deployed with the division in 1943. At the time of activation, the unit numbered 20 Officers and 195 Enlisted Men, the vast majority of them were cadred from the 82d Airborne Division. Following activation, the unit moved to Fort Bragg, Fayetteville, North Carolina on 29 September 1942 where its personnel followed airborne and parachute training which was augmented by some time spent at the Laurinberg-Maxton Army Air Support Base at Maxton, North Carolina. A period of approximately 6 weeks was later spent with participation at the Second United States Army No. 1 Tennessee Maneuvers in June 1943. The unit then returned to Ft. Bragg 20 July, prior to it being shipped overseas 5 September 1943. 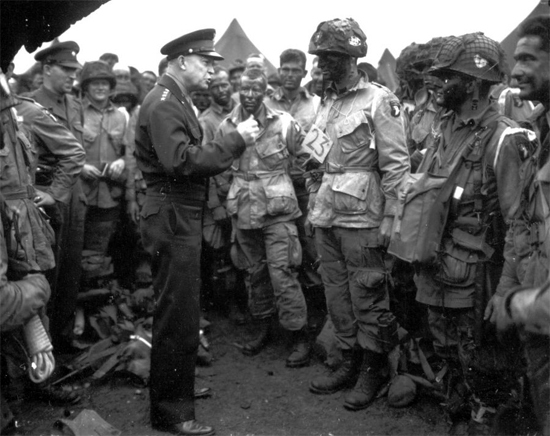 Supreme Commander Dwight Eisenhower gives the order of the day “Full victory – Nothing else” to paratroopers of the 101st Airborne Division (personnel of the 502d PIR) at the Royal Air Force base in Greenham Common, England, three hours before the men board their planes to participate in the first assault wave of the invasion of the continent of Europe, June 5, 1944. The Company was organized into a Company Headquarters, two Service Sections, and three Platoons each which carried out the same functions as the Clearing and Collecting Companies in the Medical Battalion of an Infantry Division. Each Platoon had Headquarters, Litter Bearer, Ambulance and Treatment Sections and supported one of the Division’s Parachute or Glider Infantry Regiments during combat operations. The unit finally arrived in England on 15 September 1943 and was located in the general vicinity of Newbury, West Berkshire. Training continued once in the United Kingdom in preparation for Operation “Neptune”, which would represent the unit’s first combat mission and assignment. On D-Day, the 326th Airborne Medical Company was committed to action in the Normandy Campaign in a three-fold manner; by parachute, by glider, and by sea. Medical troops of the 326th Airborne Medical Company gathered around a 1/4-ton Truck, talking to locals outside Carentan Church, 15 or 16 June 1944. 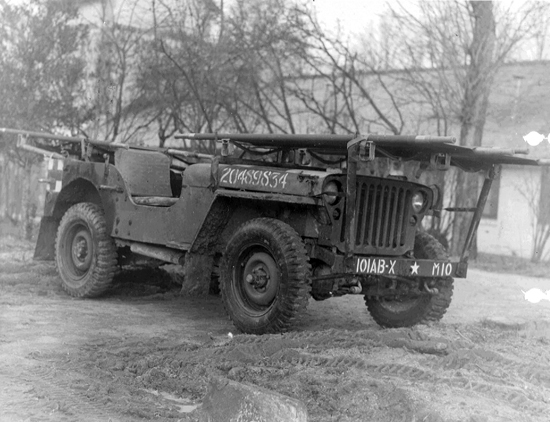 Note the unit marking applied to the Jeep above the rear wheel. The Regimental and Battalion Medical Detachments entered combat with the following personnel strengths: Parachute Regiments – 9 Officers and 60 Enlisted Men; Glider Regiments – 7 Officers and 64 Enlisted Men; Engineer Battalion – 2 Officers and 17 Enlisted Men; Antiaircraft Battalion – 2 Officers and 24 Enlisted Men; Field Artillery Battalions – 8 Officers and 45 Enlisted Men. In addition, Team #20 of the 3d Auxiliary Surgical Group was also attached to the unit, comprising 4 Officers and 4 Enlisted Men, under the command of Major Albert J. Crandall. One element of the Company, 4 Officers and 45 Enlisted Men, landed in the combat zone by parachute. Another group, consisting of 7 Officers and 21 Enlisted Men, with 4 Jeeps and 4 trailers, came in by glider. The remainder of the Company constituted the seaborne echelon. The Company retained its platoon organization as required by the authorized T/O 8-37. The surgical equipment of the Company was entirely revamped by making each medical chest a functional piece of equipment and devising methods of precombat sterilization of the medical equipment. A Medic of the 101st Airborne Division prepares his equipment and puts on his T5 Parachute at the airfield in England. 5 June 1944. N.B. The “RS” marking applied to his B-4 Life Preservers indicates this Medic was attached to the 506th PIR (Col. Robert F. Sink > CO 506th PIR). In order to ensure that the unit was capable of dealing with all manner of injuries and wounds once on the ground, the T/E equipment was completely reviewed, adapted, and augmented for the Detachments. All heavy chest equipment was eliminated where possible, particularly for those units which had no organic transportation. Packboards for the carrying of medical installation equipment were obtained, some 250 litters and 1,200 blankets in excess of T/E allowances were distributed to the unit Medical Detachments. 12,000 British shell dressings (similar to American Carlisle Dressing, Large – but enclosed in a waterproof canvas cover) were also requisitioned. Two (2) dressings were issued to each parachutist. A copper sulfate sponge for protection against phosphorus burns was produced and 1 issued to each individual in the Division. Since there was such an abundance of individually carried material for protection against chemical warfare injuries, unit medical installations reduced this type of equipment to a minimum. Although only some 600 units of plasma were authorized this Division, a total of over 2,000 units were carried into combat. The A-5 Aerial Delivery Containers for medical equipment totaled only 7 per Parachute Medical Detachment as per authorized T/E allowances. This quantity was raised to an average of 25 containers per Regimental Medical Detachment in order to insure that essential medical installation equipment would be available to the parachute medical personnel, particularly in view of the fact that units might become isolated in the early stages of combat. 326th A/B Med Co Aid Station, after having been installed at the Château Colombières, 6-7 June 1944. In addition to the acquisition and distribution of these additional medical supplies, the Company also began to prepare the necessary medical resupply. This was planned to be done via the A-5 Aerial Delivery Container, and the S-2 had calculated that for three days requirements, 120 such containers would be necessary. These were requisitioned and filled by the men of the Company, and prepared at airfields throughout the south of England. The Medical Detachments of the 501st, 502d and 506th Parachute Infantry Regiments and the 377th Parachute Field Artillery Battalion dropped on the Cotentin Peninsula between Montebourg and Carentan at approximately H-4. The marked scattering of medical personnel made it almost impossible to collect the men into anything like its functional sections until many hours after daylight. Less than 10% of medical equipment bundles dropped could be recovered initially because of marked dispersion, and small arms fire encountered while trying to collect them. The parachute elements of the Medical Company dropped at approximately H-4. They performed first echelon medical service for the unit to which they were attached. The glider echelon of the Company landed in 2 waves. Two CG-4A glider loads landed near Hiesville, France, at approximately H-3. Three Horsa loads landed at H+14. The seaborne element, including the Division Surgeon’s Section landed at Utah Beach at H+3 and worked its way up unescorted toward Hiesville. The Company proceeded to the Château Colombières some 600 yards north of Division Headquarters, which had been selected as the location of the Clearing Station. The platoon organization of the Medical Company was disregarded at this time and a functioning Aid Station was established by Captain Willis P. McKee of the unit. Due to the scattered formation in which the troopers initially found themselves, the Parachute and Glider elements established temporary first aid posts in the immediate vicinity of the LZs and began treatment of casualties. In the early morning of 6 June 1944, Major Albert J. Crandall, having landed by glider and leading the Auxiliary Surgical Team attached to the 326th Airborne Medical Company, established himself and his group in the Château Colombières, near Hiesville, Normandy. He was subsequently joined at approximately 1300 by Captain Edwin C. Yeary. The bulk of the 326th only arrived at the Château around 1700 hours. The following unit Medical Officers arrived separately and started joining the 326th as soon as they had helped other units set up aid stations near the different DZs and LZs. As such Captain Willis P. McKee, who jumped at the head of his section, only joined the unit at 2300 hours, 7 June 1044. Captain Alfred M. Slotta, who had also jumped into combat, continued to work (he had fractured his right ankle) with the members of the Regiment he accompanied, and joined the 326th at 1400 on 8 June 1944. Captain Walter W. Meyers, also jumped into Normandy, and after being cut off from the remainder of the troops for three days, rejoined his organization at 1500, 9 June 1944. First Sergeant Otis C. Banker, was dropped erroneously, and after contacting other unfortunate jumpers made his way twenty-three miles through enemy lines to reach the Company at 1500, 9 June 1944. At 1600 hours, 9 June 1944, the 326th was able to contact members of the 564th Medical Collecting Company, and the first casualties were started forward to Utah Beach for evacuation. The excessive number of casualties immediately arriving at the Aid Station required setting up tentage outside the Château. The 2 ½-ton truck allocated to the Division Medical Supply supplemented the Company vehicles for the evacuation of casualties to the 261st Amphibious Medical Battalion (1st Engineer Special Brigade) at Utah Beach. 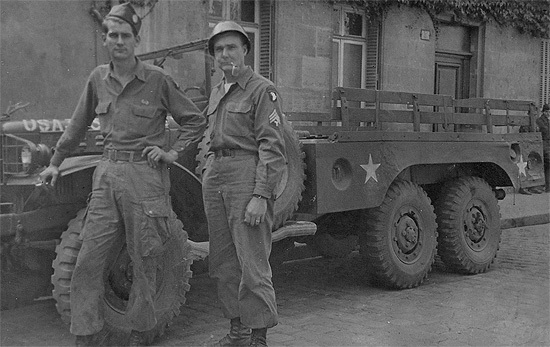 On D+2 additional trucks from the 3808th Quartermaster Truck Company were used until VII Corps evacuation (one Platoon of the 574th Motor Ambulance Company) would become available. 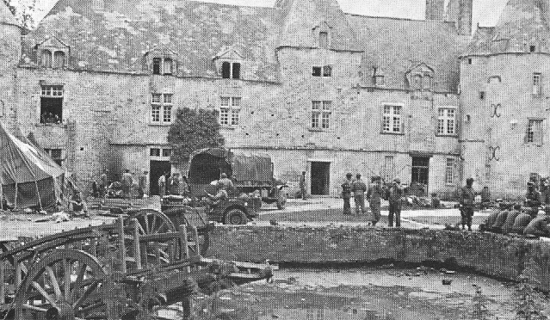 326th A/B Med Co Aid Station at the Château Colombières, Normandy, June 1944. On 8 June, the Company was able to treat and evacuate over 400 casualties. At around 2335 on the night of 9 June 1944, the Aid Station was bombed by German aircraft with two direct hits being scored on the Station itself. Evacuation of casualties was temporarily halted at that time as most vehicles had been partially damaged. Five (5) Officers and 9 Enlisted Men were injured, and 8 EM killed as a direct result of this bombing. Much of the equipment was also lost. The following day, Colonel Paul Hayes (VII Corps Surgeon) was contacted and the Division was loaned 6 Officers and 61 Enlisted Men, while receiving 3 Hospital Ward Tents from the 42d Field Hospital (which was located close to Le Grand Chemin). The treatment of sick and wounded and the evacuation continued until 25 June 1944, when the Company moved with the Division to Cherbourg. On 10 July 1944 the Company moved again to the vicinity of Ste-Marie-du-Mont in preparation to be shipped back to England. The unit loaded onto an LST at 2200 the following evening and spent the night lying just off the Norman shore. By 1100 on 12 July 1944, the unit sailed for England and docked at Southampton at 2300. Once ashore and having debarked, the personnel continued by train to their billets at Templeton House and Standen Manor (Berkshire), finally reaching their destination around 0200, 13 July 1944. Medical personnel of the 326th A/B Med Co preparing their instruments while at Hiesville, Normandy, early June 1944. 326th A/B Med Co at the Château Colombières. Assessing the damage after the Luftwaffe bombing. While the percentage loss might seem high in comparison to other Medical units which took part in the early stages of the Normandy operations, it was less than had been calculated prior to combat. Since small numbers of Medical personnel within the Division did not permit to set aside reserve personnel for possible replacement of front line losses, the evacuation of casualties was definitely hampered by the loss of the above men. Following on from lessons learned during Operation “Overlord”, the Table of Equipment requirements were once again revamped and augmented. Packboards were found to have been impractical and the recommendation was made to supplant them with one ¼-ton truck and 1 ¼-ton cargo trailer. Litters, blankets, shell dressings, plasma and copper sulfate sponges were carried in the same manner and distribution as in Normandy. The medical personnel entered the combat area in echelons. All Medical Detachments accompanied their units either as glider or parachute elements. Medical personnel and vehicles of the 326th A/B Med Co stand by to pick up casualties for evacuation to the 261st Amphibious Medical Battalion, 1st Engineer Special Brigade. The 326th Airborne Medical Company was committed to Operation Market in two waves. The first wave, consisting of six CG-4A glider loads transporting, 2 ¼-ton trucks, 2 trailers, and 52 personnel, departed from Ramsbury Airfield at 1030 and landed at Son, Holland at 1345, 17 September 1944. The second wave, consisting of 54 CG-4A glider loads, transporting 31 ¼-ton trucks, 23 trailers, and 219 personnel departed from Welford Airdrome at 1125 and landed at Son, Holland at 1440, 18 September 1944. The flight was without trouble on both waves, except for light to moderate flak encountered en route to the LZ. No personnel were wounded while in the air, and no loads lost. All equipment arrived in the gliders in serviceable condition. Personnel strength of the 326th A/B Med Co consisted of 21 Officers and 176 Enlisted Men under the command of Major William E. Barfield, MC. In order to increase the unit’s medical capacity the First Airborne Surgical Team was attached for the operation. Its CO was Major Albert J. Crandall, assisted by 3 Officers and 4 Medical Technicians.On 29 August 1944, B Platoon, 50th Field Hospital, was temporarily attached to the organization as well. Commanded by Major John L. Sharpe, it consisted of an additional 5 Officers, 5 Nurses, and 52 EM. In the initial wave the two trailers were loaded with two ward tents and the necessary equipment to set up two operating tables. Electrical power was provided in the form of two field generators, which were also included in the same two loads. The gliders were unloaded immediately and no difficulty was encountered in retrieving the equipment in the field. The treatment of casualties was begun immediately by the Officers while the Enlisted personnel were setting up a temporary Aid Station at the southern portion of the glider landing field. Casualties began arriving at the station at 1500, 17 September 1944. By 1700 the ward tents were in full operation, and the first surgical operations were being performed. Close-up photograph of Catholic Chaplain (Captain) Manus McGettigan on DZ “C” 17 September 1944. Protestant Chaplain (Captain) Tildon S. McGee sits a few yards in front of him. Both Chaplains belonged to the 506th PIR. At 1800 the TBC Sanatorium at Son, Holland, was taken over by the Company and the equipment and personnel were moved in by 1900 to establish a Clearing Station (the objective was to triage, provide first aid, and evacuate, if possible, the patients to the 24th Evacuation Hospital situated in Leopoldsburg, Belgium –ed). The treatment of casualties was then carried on under more ideal conditions. By 2400, 17 September 1944, 107 casualties had been admitted to the Station. Following identification, the dead were then assembled and evacuated to the temporary military cemetery at Wolfswinkel, north of Son. The second wave was met as it came down on the expected glider LZ on 18 September 1944, and started immediate treatment of landing casualties; the group was then assembled, and arrived at the Hospital at 1600. The Litter Bearer and Ambulance Sections were sent to the respective Regiments the night of 18 September 1944. By the following morning, contact had been established with the combat troops at Veghel, and the attached B Platoon of the 50th Field Hospital was sent to establish an Aid Station at this location in support of the 501st PIR. On the afternoon of 19 September 1944, the 493d Medical Collecting Company (CO > 1st Lieutenant James L. Fearon –ed) established contact with the Company at 1500, and at 1610, sixty walking-wounded were evacuated to the 24th Evacuation Hospital (CO > Colonel Carl M. Rylander –ed). Due to the moving of traffic north, no further evacuation to the south was accomplished until 0615, 20 September 1944, at which time evacuation to the rear from Son was non-interrupted. On 20 September the unit had 30 ambulances and 14 2½-ton trucks available for evacuation to the rear. Photograph of 506th PIR Chaplains; Captains Manus McGettigan and Tildon McGee. 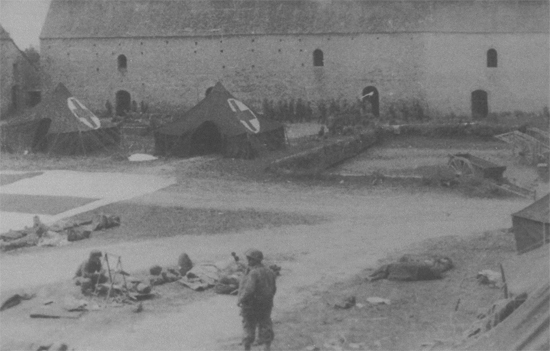 Photo taken in Son, 17 September 1944. On 21 September 1944 at 1500, one surgical team was sent to Veghel to assist the Platoon of the 50th Field Hospital located there. On 25 September 1944, at approximately 1600, the road between St. Oedenrode and Veghel was cut by the enemy. Evacuation from Veghel south became impossible until approximately 2200 the following day. On 3 October reconnaissance of the Nijmegen area was made prior to moving the Company to this new location. On 4 October B Platoon of the 50th Field Hospital was transferred from Veghel to Nijmegen, and the following day the unit was sent across the Waal River to establish a Station and to support the troops located on “The Island”. In the meantime, the 101st Airborne Division seaborne elements had also arrived, bringing in 5 trucks, 6 ambulances, and an additional 24 men. Two days later, the Company also moved to Nijmegen by motor convoy to establish and operate an Aid Station there. The work was soon completed, and the first casualties were received at approximately 0600, 6 October 1944. During the period 17 September – 17 October 1944, the 326th Abn Med Co treated 2,020 patients. 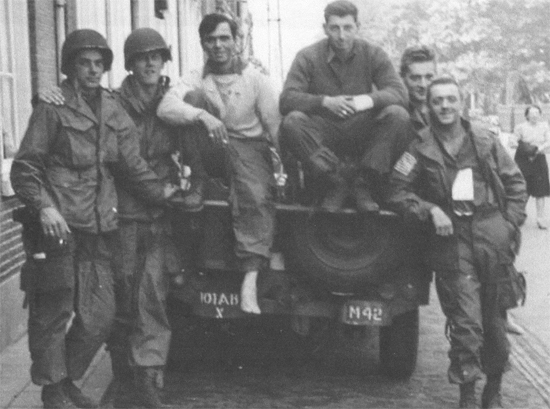 Personnel of the 326th A/B Med Co take some free time after the Liberation of Veghel, 19 September 1944. 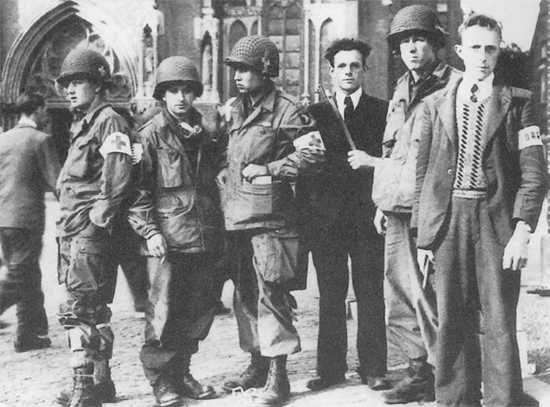 They are photographed with members of the Dutch Resistance in front of St. Lambertus Church. On 22 October 1944, the 326th Airborne Medical Company received the first of a series of a new type of casualty. This patient underwent a traumatic amputation of the left foot as a result of the explosion of a German Schuh-Mine. During the period of 22 October 1944 to 29 October 1944, 18 such cases were received at the Station. These casualties were in deeper shock than any other type of casualty received during the entire operation. Two of these patients died as a result of shock before any definitive surgical procedure could be performed upon them. Practically all of the amputations occurred at the level of the middle of the leg. An unusual feature noticed was that practically all of them were left lower extremity injuries. The Company continued to operate a Station in its initial location at Nijmegen until 1330, 29 October 1944, at which time it was bombed. Since the Station had been struck by AP bombs at 1000 and by rockets at 1130, it was deemed advisable to move the unit to a new location following the bombing which rendered the building untenable; all windows having been blown out. Medical personnel of the 326th A/B Med Co and lightly wounded troopers take some time for a snapshot. 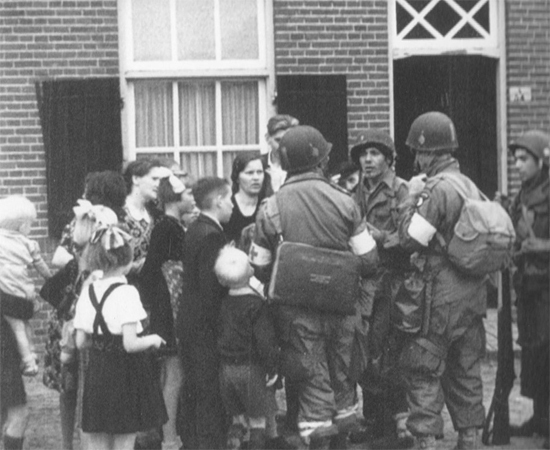 Photo taken in Veghel, 19 September 1944. The Company suffered 3 killed and 6 wounded as a result of the bombing. In addition, 2 attached personnel were wounded. The 493d Medical Collecting Company, which was evacuating the 326th personnel, lost 2 men and 4 wounded. At the time of the bombing two trucks from the 397th Quartermaster Truck Company were in the Station delivering rations. The Company was moved to the area occupied by the 24th Evacuation Hospital where it spent the night of 29 October 1944. The following morning it was moved to the Division Rear CP where it continued to operate. At 1800 14 November 1944, the Platoon of the 50th Field Hospital was relieved from duty on “The Island” and brought to the Division Rear CP. The following day this unit was sent to Mourmelon, France. Personnel from the Company, consisting of 2 Officers and 20 Enlisted Men, established an Aid Station in the location formerly occupied by the 50th Field Hospital. These personnel were rotated every 48 hours. 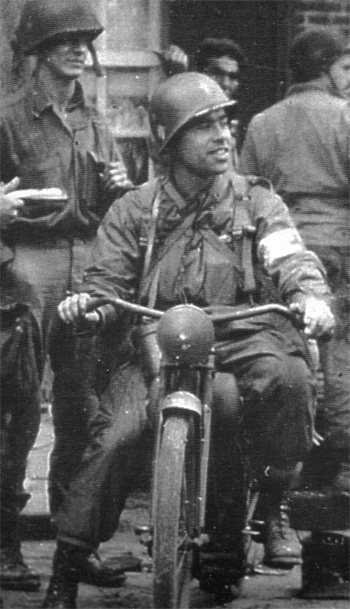 Photograph of Captain Francis L. Sampson, 501st PIR Catholic Chaplain on a light motorbike in Holland (he was captured by the Germans near Bastogne 20 December 1944). This Station was closed 27 November 1944, as the last combat troops of the Division were cleared completing 71 continuous days of combat medical service in Holland. At this time the entire unit was en route to or closed in Camp Mourmelon, France, with the exception of 1 Officer and 3 EM who remained at Nijmegen, Holland, to furnish medical coverage for the Division Rear Detachment. This group closed in Camp Mourmelon, 1 December 1944. 326th A/B Med Co personnel and ambulance-jeep in standby opposite the 501st PIR Collecting Station, while the Liberation festivities continue. 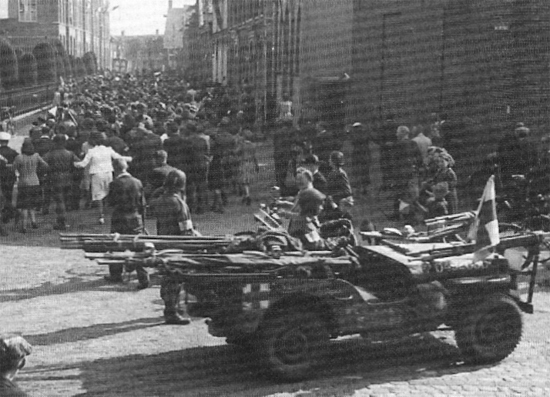 Veghel, 19 September 1944. On 17 December 1944 the 326th Airborne Medical Company was alerted and ordered to move by motor convoy from Camp Mourmelon, France to the vicinity of Bastogne, Belgium to provide second echelon medical care and evacuation to the 101st Airborne Division. The personnel and equipment of the Company were loaded and moved out, crossing the IP at approximately 2000, 18 December 1944, arriving after a night march at their destination at 1000 the following day. The Division Clearing Station of the Company was immediately set up near Herbaimont and began receiving patients by 1100 hours 19 December 1944. S/Sgt Raymond S. Gebhardt (here still a Technician Fourth Grade) stands in front of a WC63, 1 ½-ton Cargo & Personnel Carrier with a fellow member of the 326th A/B Med Co. Courtesy Wendell Phillips. The Commanding Officer, Major William E. Barfield, and Lt. Colonel David Gold, Division Surgeon, made a reconnaissance and contacted the C.O. of the 64th Medical Group to arrange for the evacuation of the wounded from the Division Clearing Station to the 107th Evacuation Hospital which was located at Libin, and at the same time secured added ambulance support from that organization. 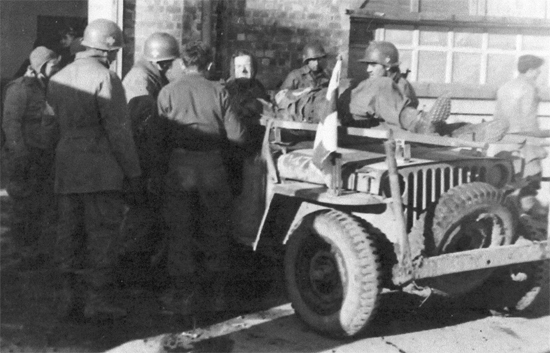 At 1030 hours, 19 December 1944, the Medical Company’s ambulance-jeeps, under the direction of the Medical Company’s evacuation Officers were dispatched to the Regimental and Battalion Surgeons in and around Bastogne as follows: 327th Glider Infantry Regiment, 4 jeeps, 2d Lt William Dennis; 50lst Parachute Infantry Regiment, 5 jeeps, 1st Lt George V. Evans; 502d Parachute Infantry Regiment, 4 jeeps, 1st Lt Henry Barnes; 506th Parachute Infantry Regiment, 4 jeeps, 1st Lt Charles S. Phalen Jr. These ambulance-jeeps were used to transport the wounded from the Battalion Aid Stations to the Division Clearing Station. 101st Airborne Division personnel retrieve an A-4 Aerial Delivery Container containing medical supplies. Photo taken in the Bastogne area. Resupply missions took place between 23-27 December 1944. 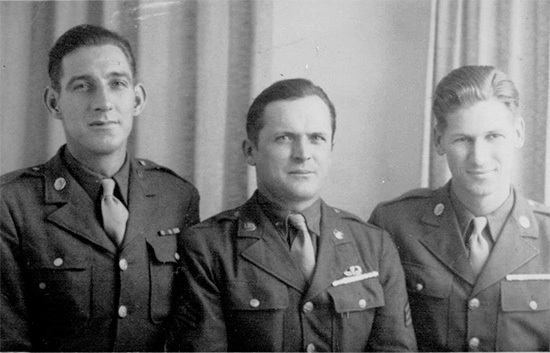 From L to R: Private Archie Weindruch and Corporal Leroy Schulenberg, members of B Company, 506th Parachute Infantry Regiment. At 1630 hours, 19 December 1944, the Commanding Officer formed a convoy of 5 ambulance loads of patients, the first evacuation from the Division Clearing Station and lead the way to the 107th Evacuation Hospital, set up at Libin. On the return trip the bridge located near Sprimont was found to be blown. Because of this and due to the dense fog and fluid conditions of the enemy forces in the area, the CO returned with the ambulance convoy to the 107th Evacuation Hospital to remain overnight. The evacuation of casualties from the Regiments to the Division Clearing Station continued until 2130 hours, 19 December 1944. 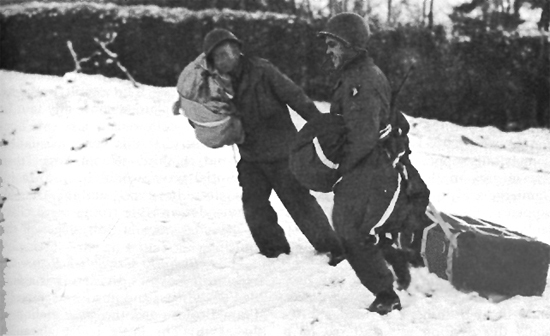 At 2130 hours, 19 December 1944, 2 vehicles loaded with casualties were sent from the Regimental Aid Station of the 501st Parachute Infantry Regiment at Bastogne, to the Division Clearing Station, under the direction of Captain Carlos D. Lancaster, 501st PIR. These vehicles and personnel had not returned by 2330. 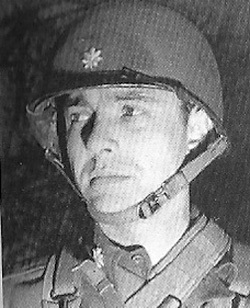 At 2400, Lieutenant Phalen, the Evacuation Officer of the 327th Glider Infantry Regiment, attempted to take casualties to the Division Clearing Station. He was stopped by the 327th GIR outpost guards and informed that the Germans had apparently captured or overrun the Division Clearing Company. The Officer returned to the 501st Parachute Infantry Regiment Aid Station and reported the incident to the Surgeon. The following personnel were captured at the time by the enemy: 11 Officers and 119 Enlisted Men of the 326th Airborne Medical Company, 3 Officers and 2 Enlisted Men of the Division Surgeon’s Office, and 4 Officers and 3 Enlisted Men from Team #15, 3d Auxiliary Surgical Group. 1 Enlisted Man from the Medical Company (Pfc Henry G. Sullivan) was killed. A total of 18 Officers and 125 Enlisted Men were lost. 2 MC Officers, 2 DC Officers, 4 MAC Officers and approximately 113 EM were left in the organization. 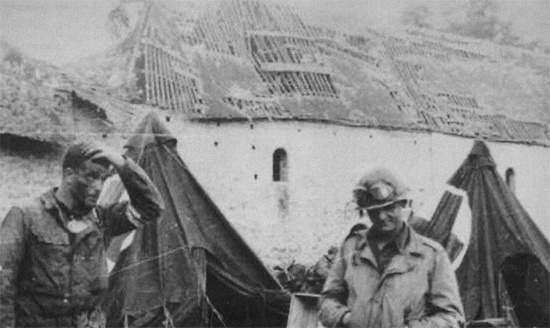 At 2400, 19 December 1944 the Evacuation Officer with the 327th Glider Infantry Regiment discovered that the Medical Company had been captured. This information was passed on to the Regimental Surgeons at 0400, 20 December 1944. At 0630, 20 December 1944, 1st Lieutenant Evans, 326th Airborne Medical Company, with the 501st Parachute Infantry Regiment contacted the Division G-4 and confirmed the capture of the Company. At this time the problem of medical treatment and evacuation was discussed. The G-4 stated that medical assistance had been arranged for through the VIII Corps Surgeon and that the 429th Medical Collecting Company would set up their Collecting Station in tents at Jordenville and would evacuate the casualties of the Division. 326th A/B Med Co ambulance-jeep in the area of Bastogne, Belgian Ardennes, December 1944. The evacuation of casualties to the 429th Medical Collecting Company began at 1100, 20 December 1944, and continued until 1700, 20 December 1944, at which time, because of extremely cold weather and inadequate lighting the Station was moved to Molinfaing and set up in a school building. Rapid ambulance evacuation to this new location was greatly hampered as a result of fog and motor convoys on Route N15 between Bastogne and Molinfaing. By 2330, 20 December 1944, the enemy had succeeded in cutting the Bastogne-Neufchâteau road, the last route of evacuation to the rear. The wounded being held at the 501st Regimental Aid Station, ambulance collecting point, awaiting evacuation, mounted to 129 litter cases and 28 walking wounded by 0630, 21 December 1944. The question of more space and medical personnel arose and was discussed by Lieutenant Evans with the Division G-4. It was agreed that Major Martin L. Wisely, 327th Glider Infantry Regimental Surgeon, would call in to supervise the Medical Officers and personnel of the 81st Airborne AA Battalion, 326th Airborne Engineer Battalion, Division Artillery and 705th Tank Destroyer Battalion. These units were to form a temporary second echelon medical clearing unit, or Hospital, for the treatment and care of the wounded in the besieged town. This Clearing Station was opened and began receiving wounded at 1030, 21 December 1944. Normal medical care and procedure were carried out. 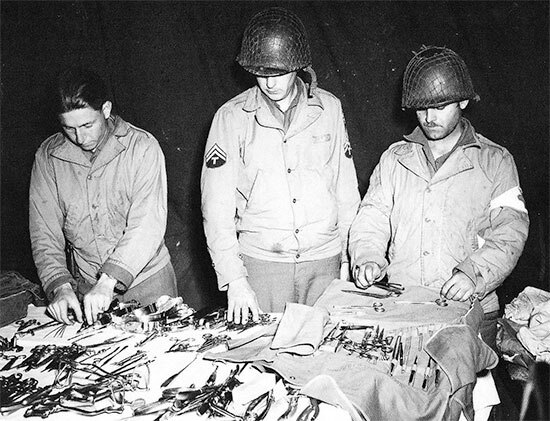 Medical supplies, except for whole blood and penicillin were plentiful because of an abandoned Army Medical Supply Depot discovered in Bastogne. Despite the impossibility of resupply, enough essential stores were on hand to meet the situation. A few vitally needed medical items in addition to the regularly planned resupply were dropped by parachute on 23, 24, 26, 27 December. A much needed supply of penicillin was flown in by means of an L-1 aircraft (Piper Cub -ed) at 1830, 25 December 1944. On 25 December 1944, Maj. Howard F. Serrel, MC (Third US Army), a qualified surgeon was flown into Bastogne in a type L-1 aircraft. This surgeon, assisted by the medical personnel did 15 surgical procedures in 36 hours. Again on 26 December 1944 at 1600 hours, an emergency surgical team consisting of Major Lamar Soutter, MC; Captain Stanly P. Wesolowski, MC; Captain Roy H. Moody, MC, (O-511937); Captain Edward N. Zinschlag, MC; Captain Henry M. Mills, MC; and 4 Enlisted Surgical Assistants (all Third US Army personnel) were flown in by CG-4A glider. Although the buildings which were being utilized as hospital wards were under constant enemy artillery fire, periodic bombing and strafing, the medical personnel worked untiringly and devotedly until the siege was lifted. A total of 943 American, and 125 German casualties were collected and taken care of at the temporary second echelon medical clearing unit and at the 501st Parachute Infantry Regimental Aid Station. At approximately 0700, 27 December 1944, a road into Bastogne was opened. 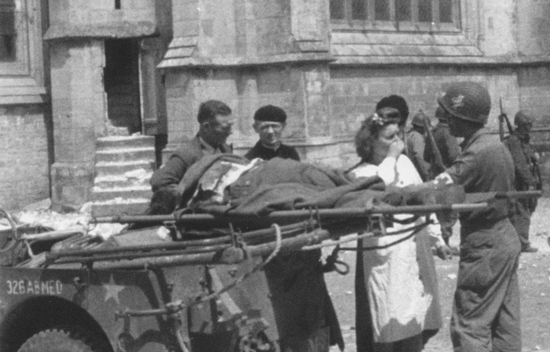 By 1800, a convoy of 22 ambulances loaded with the more seriously wounded and 10 x 2½-ton trucks loaded with slightly wounded patients were evacuated to the 635th Medical Clearing Company at Orval. By 1900, 27 December 1944, all casualties had been evacuated. Routine ambulance evacuation was established and maintained by the 495th Motor Ambulance Company from 28 December 1944 on. Illustration showing the specialist litter rack created by the 326th A/B Med Co and mounted on one of its ¼-ton Trucks. The modification was designed by Lieutenant Louis G. Shadegg (326th A/B Med Co) for airborne use and could fit into a C-47 cargo plane or CG-4A glider. On 28 December 1944, Major William E. Barfield, CO 326th Airborne Medical Company, relinquished his command to Captain Roy H. Moore, Jr.. Major W. E. Barfield was eventually appointed Division Surgeon. Captain Moore returned to Camp Mourmelon, France to reorganize and train the reinforcements replacing the personnel lost at Bastogne. The same day, the 60th Field Hospital was attached to the 101st Airborne Division and on the same date took over and functioned as such. The 60th Field Hospital was relieved by Third United States Army and was replaced by A Company, 92d Medical Gas Treatment Battalion. Because of increased enemy artillery the Division Commander ordered the 92d Medical Gas Treatment Battalion to move to Cobbreville. This unit functioned as the Divisional Clearing Station until 20 January 1945. On 31 January 1945, the (daily) Company Morning Report, of the 326th Airborne Medical Company, 101st Airborne Division, duly signed by Captain Roy H. Moore, Jr., Commanding, reported from its station at Camp Mourmelon, France, APO # 472, that 60 Enlisted Men were assigned and joined from Headquarters, 2d Replacement Depot, effective 28 January 1945. (note: The ETO Medical Service labored through the various campaigns under a chronic shortage of both Officer and Enlisted replacements. Replacements usually came from 3 sources: recovered sick and wounded released from hospitals; personnel from units rendered surplus by T/O changes or transferred out for other reasons; casuals sent from the ZI in predetermined numbers, on Theater requisition, to specifically replace losses –ed). At 1440, 20 January 1945, the collecting elements of the 326th Airborne Medical Company consisting of 4 Officers and 47 Enlisted Men accompanied by 1 Officer and 1 Enlisted Man from the Division Surgeon’s Office moved by motor convoy from Cobbreville, to Drulingen, Alsace-Lorraine, France. 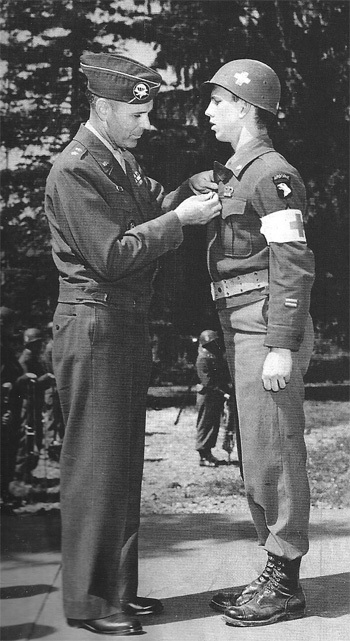 Private George A. Whitfield, ASN 33418676, member of the 326th Airborne Medical Company is awarded the Distinguished Service Cross by Major General Maxwell D. Taylor (CG > 101st Airborne Division) for extraordinary heroism in connection with military operations against enemy forces on 26 September 1944 in Holland (ref. GO # 14, Headquarters, XVIII Airborne Corps, dated 17 December 1944). A number of lessons were learned as a result of the combat operations undertaken by the 326th Airborne Medical Company. For example, the recovery of the A-5 Aerial Delivery Containers packed with medical equipment was only 30% of the number dropped. This loss was excessive and in a large measure due to dropping of bundles during hours of darkness so that spotting of bundles could not be accomplished and later located. 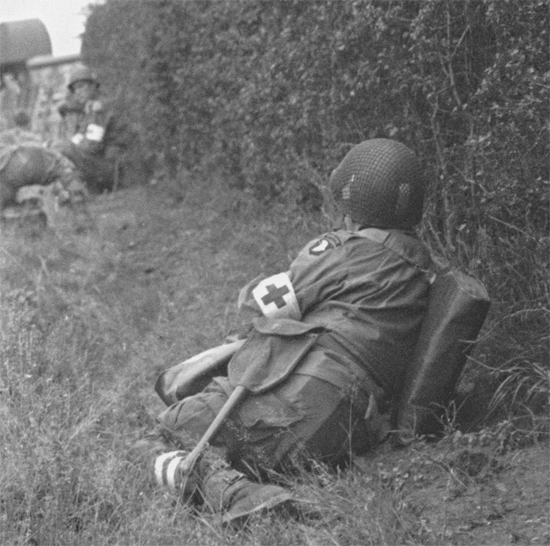 It was noted that no bundles should be dropped during night hours; medical bundles should be dropped during daylight hours if combat conditions permit, as shown during Operation Market Garden. 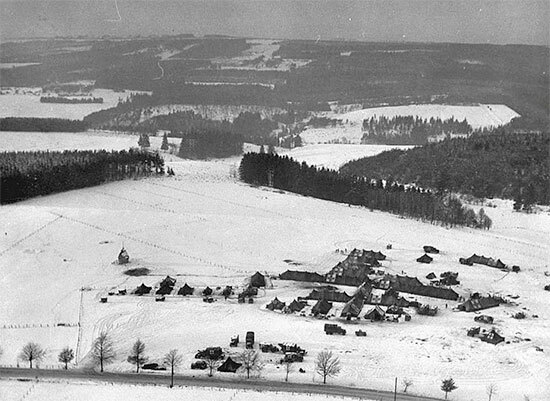 Aerial view of the 326th A/B Med Co’s setup near Sainte-Ode, Belgium, 18 December 1944 (where the small hospital was eventually captured by the enemy). The individual soldier’s first-aid equipment proved excellent and could hardly be improved upon. The following items were formally recommended to be carried by the individual soldier in all future operations: Kit, Parachutists, First-Aid; Shell Dressings (British); Copper Sulfate Sponges, First-Aid Packet (Carlisle model), Sulfadiazine Tablets. The Company continued to offer support to the Division during the remainder of the conflict in Europe. After V-E Day, the unit was officially deactivated along with the 101st Airborne Division on 30 November 1945 at Auxerre, France. For its efforts during WW2, the 101st Airborne Division was awarded four campaign streamers and two Presidential Unit Citations. The Division suffered 1,766 killed in action; 6,388 wounded in action, while 324 died of wounds during the conflict. Copy of US propaganda leaflet “Frontpost” Ausgabe Süd, Nr. 61, dated 19. 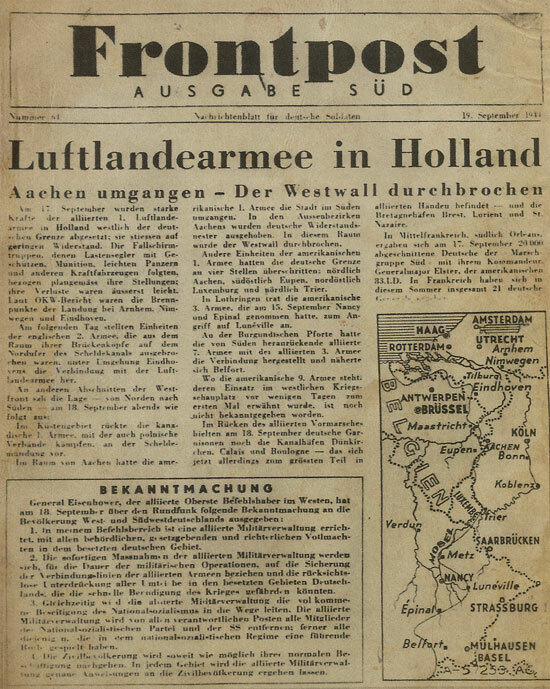 September 1944 (Psychological Warfare) printed in Italy and dropped over German Forces in Italy informing them of the recent Allied Airborne Army operations in Holland and the current Allied successful advance in the European Theater. Private First Class Roger K. Powell (L), ASN 35425054, and 2 unidentified members of the 326th Airborne Medical Company. Photo taken at the end of the war. (Pfc R. Powell was killed in Normandy 8 June 1944, and is buried in the Normandy American Cemetery). Photo courtesy Cindy Ball. The MRC Staff are still looking for a complete Unit Roster and welcome any additional data relating to the 326th Airborne Medical Company’s operations in World War 2. Thank you. Some of the images used on this page are courtesy of the Carentan Historical Center, Normandy, France and remain their property and copyright. The authors would also like to thank Stephen Richey for kindly providing some of the names for the Unit Roster. We would also like to extend our thanks to Wendell Phillips, nephew of S/Sgt Raymond S. Gebhardt (ASN:33897065) who served with 326th during WW2, for sharing photographs of his Uncle’s service. Further thanks should go to William Welch, son of Pfc William A. Welch (ASN:36655498) who also served with the unit and provided us with some personal data about his Father. We are also very grateful to Historian/Researcher/Genealogist Brian Siddall who forwarded some very useful data to complete our Unit History.